In 2016, 83.9% of the Tucson Metropolitan Statistical Areas (MSA) population reported good or excellent health. This ranked Tucson seventh among peer western communities, just ahead of the national rate. Salt Lake City ranked first with 87.2% of the population reporting good or excellent health, while El Paso’s rate of 71.0% placed it last and off the gauge. Tucson’s percentage of the population that reported good or excellent health increased by two percentage points since 2012. Many factors determine one’s health and well-being. An individual’s health plays an important role in their quality of life. Additionally, diseases like diabetes, heart disease, and obesity have high financial costs for the nation. According to the Centers for Disease Control (CDC) heart disease is the leading cause of death in the U.S. Regular physical activity plays an important role in the prevention of many health related diseases including heart disease. The U.S. Department of Health and Human Services defines regular physical activity as participation in moderate and vigorous physical activities as well muscle strengthening activities. According to data collected in 2015 for the Behavioral Risk Factor Surveillance System nearly 80% of adults in the U.S. do not meet the guidelines for both aerobic and muscle-strengthening activities. Health data is vital to identifying emerging health problems and trends. Additionally, health data can be used to identify areas where public health policies may be needed and to evaluate existing programs. Residents living in the Tucson MSA reported an average of 3.9 poor physical health days per month. Tucson ranked eighth among peer western metropolitan areas. Those living in Denver reported the least number of poor physical health days during 2016 at 3.0 per month, while residents who live in El Paso reported the highest number of poor physical health days at 4.6. The reported incident of heart conditions, both heart attacks and coronary heart disease, are significantly lower for Tucson residents than those in the state or the nation. In 2012, the latest data that is available for Tucson, the reported rate of heart attacks was 2.9% nearly half of the reported rate for the nation. Similarly, the reported rate for coronary heart disease at 3.2% was 1.2 percentage points lower than the national rate. Among the 12 western metropolitan areas, Tucson’s residents had the fifth lowest prevalence of obesity in 2015. San Diego residents posted the lowest rate at 20.4% followed closely by Denver at 20.6%. The state of Texas had two metropolitan areas with high rates of obesity when compared to other peer communities in the West. El Paso had the highest rate among all the metropolitan areas at 29.5% and San Antonio the second highest rate at 28.6%. The percentage of the population who had a diagnosed prevalence of diabetes in 2015 ranged from 6.1 to 10.5 percent among the western metropolitan areas. Tucson’s rate of 8.7% ranked it seventh with Denver posting the lowest prevalence at 6.1% and Las Vegas the highest at 10.5%. In 2016, the percentage of the population that reported good or excellent health in the Tucson MSA was higher than both the nation and the state. 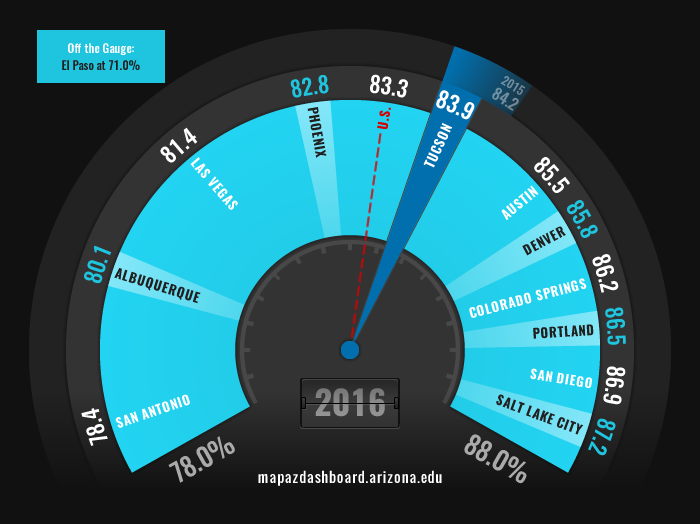 Tucson’s reported percentage at 83.9% was just about a half percentage higher than the nation and 1.8 percentage points higher than the state. The percentage of residents in Tucson that report good or excellent health over the past few years has generally been near 84.0%, with a slight decrease in 2012. The nation has posted consistent rates of good or excellent health since 2011 with a slight upward trend. A majority of the data reported in the Physical Well-Being indicator originates from the Behavioral Risk Factor Surveillance System (BRFSS). The BRFSS is a health-related telephone survey that collects state data about U.S. residents regarding their health-related risk behaviors, chronic health conditions, and use of preventative services. The BRFSS data presented is collected from the Centers for Disease Control and Prevention (CDC) and the County Health Rankings. In order to provide the most up to date data on the MAP Dashboard, diabetes and obesity data for the Metropolitan Statistical Areas (MSAs) and the Arizona counties is gathered from the CDC’s Diabetes Interactive Atlas. Please note that Diabetes and obesity data reported for the U.S. and western states is from the BRFSS and is not comparable to the Diabetes and obesity data reported for the MSAs and Arizona counties.